← The first glorious day of the rest of my life! At daybreak Spike, Bridget, and I walk along the lake’s shore. This post was delayed due to lack of connectivity. It is about Wednesday, Aug. 17, 2011. The air temperature is as comfortable as a living room, only better because I can feel a light breeze on my face. The crew is picking up a lot of scent in spite of the morning stillness. (Non-stop nose-twitching!) We step up the pace and after a brisk walk, I lead them down to the water to get a drink. Spike lies down in the water, of course. 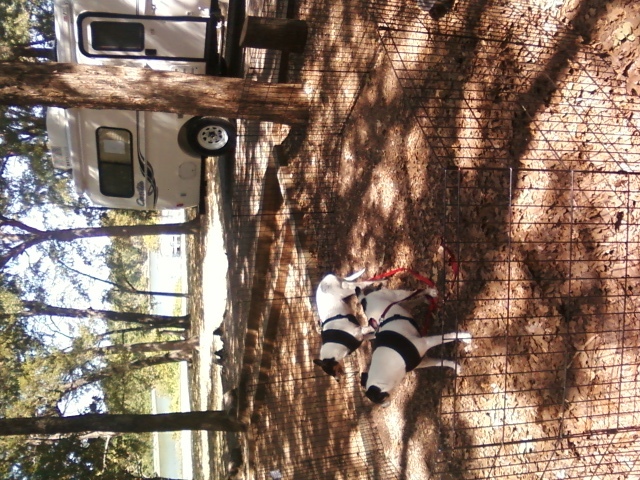 The canine crew enjoys the campground life! No more days cooped up in the house waiting for me to come home after a long day at work. Spike says, "Ah, this is living." The light changes slightly as sunlight comes through the trees on the bank across the cove. We sit on the dock a few minutes, then meander back to our camp. . . the crew to the exercise pen and me to sip coffee in a camp chair nearby. 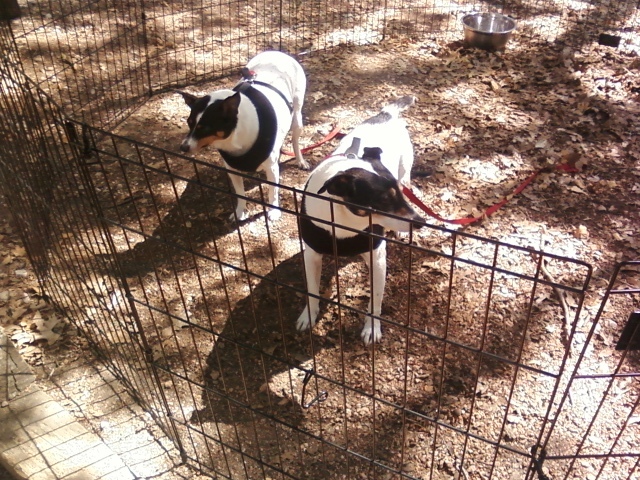 Spike and Bridget watch the squirrel from their pen. I didn't bother to drive the stakes in . . . the pen, not the crew, silly! It didn't seem necessary as I'm always a few feet away. You can see the glow of the early morning sun as three ducks visit our campsite. Suddenly Spike and Bridget leap to attention with low growls, ears erect. 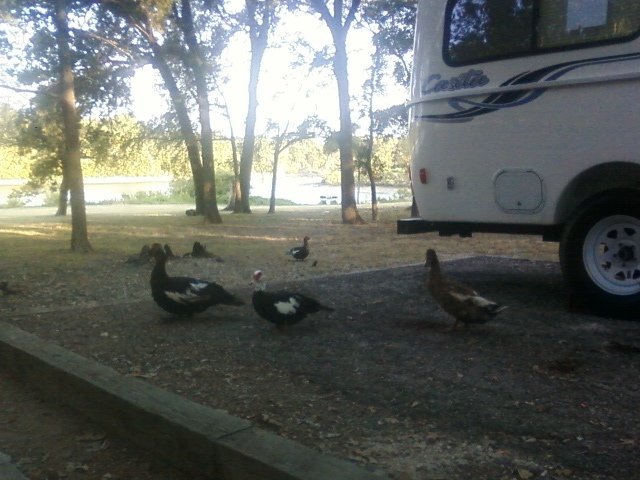 I look and see three ducks waddling up to our campsite, obviously looking for breakfast. I talk the crew into a calm state. Soon our visitors figure there are no hand-outs forthcoming and they move on. A squirrel makes an appearance, too. I bring some supplies into the kitchen from the PTV. I’m fairly well-stocked with non-perishables such as peanut butter, spaghetti, beans, rice, and tuna fish. Reine knocks on the door, comes in, and sits on the bench seat across from me. Every visit brings more ideas, gifts, and tutorials! Then she invites me to go grocery shopping. “What about the crew?” I ask. “Oh, Paul can stay and watch them,” Reine responds matter-of-factly. She then points out that she’s going to get some ant traps and I’ll need them, too. It’s true. Tiny black ants are appearing inside the Casita. Fortunately they don’t bite and aren’t too numerous . . . yet. She gives her best shot at looking pathetic. “No, I don’t think it would be good for me to leave Bridget. It’s too soon for her to see me ride away.” At Reine’s suggestion, I write a shopping list, and off she goes with Paul to WalMart and beyond. Paul returns with plexiglass for my screen door! 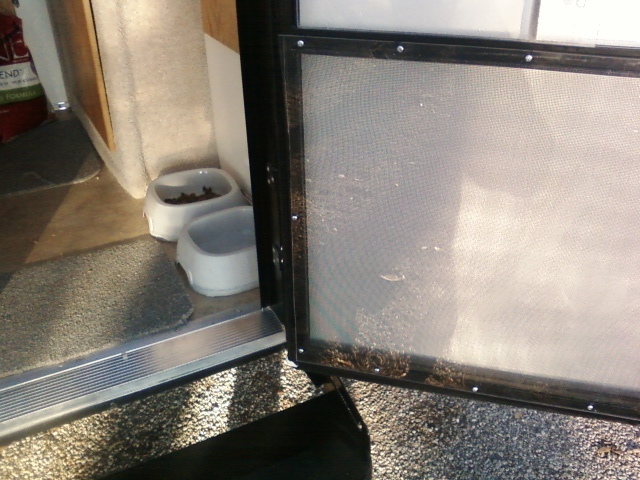 The plexiglass protects the lower part of the screen door. Notice the perfect spot for the crew's dishes. When we first arrived here I expressed my fear that the crew would wreck my screen door in two seconds flat as soon as my back is turned. So Paul duct-taped a styrofoam panel as a temporary precaution and it worked very well. Now he sets about installing a permanent solution. He gets his drill and before long the custom-cut plexiglass is screwed to the bottom portion of the screen door. An excellent job! It looks like it came from the factory this way. I am very pleased! And my refrigerator is now stocked with lettuce, a green pepper, an onion . . . I’ve got potatoes and bananas and tomatoes . . . Thank you, Paul and Reine! I learn more about setting up camp. While out shopping, Reine picks up a two-pack of water filters for me and the crew. She and Paul show me how to hook it up to the “city water” intake. Paul tells me about the time before he had a filter when he saw gunk at the supply end of his fresh water hose. Hearing that, I’m glad I have one. Actually, I have two! Reine shows me how to set up the awning. Later in the early evening we talk about where the crew and I are going next. Paul and Reine are leaving tomorrow to go home to Plano. Unless I plan to stay here through the weekend, it would be best to move to a new campground tomorrow (Thursday). I really like the Corps of Engineers parks if they are anything like this one. Reine gives me a fold-out-flat map of Texas and I decide to look at my Camping with the Corps of Engineers book (S.L. Hinkle) back at my Casita, as well as look at the recreation.gov site. This exercise pen is one of the smartest purchases I made when preparing for vagabonding with the crew! Reine gives me a slice from her watermelon and after “good nights,” I take it back to my Casita, put Spike and Bridget inside, and give them their kibble. When they finish, they get a bite of my tuna fish salad sandwich. They have one more brief walk before bed. I adjust the A/C so it’s not too cold during the night. I climb into bed next to Bridget and Spike. Looking over the map of Texas again, I wonder where we will be this time tomorrow. This entry was posted in Simple living and tagged campground, camping, casita, dogs, exercise pen, Navarro Mills, plexiglass, Travel, water filter. Bookmark the permalink. Glad you have connectivity again. Hope you got some rest between Thursday and Sunday. It’s great to be back! It was fun being with you and Paul. Thanks again! I still haven’t gotten a water filter – but I don’t like that comment about gunk in the hose. That will definitely make me get one. Yuck! Thanks for the info. The screen door addition was brilliant. And much better to add it now, rather than after the dogs scratch through the screen. It looks original. Paul did a beautiful job on the door. This morning I had the solid door open and the screen door closed (even though the A/C was on). I wanted the crew to be able to see me outside while they were inside (so they wouldn’t start barking.) I may end up having the top covered in plexiglass, too, so it can be the see-through door instead of the screen door. It would turn it into a storm door, too. Ducks have a way of reminding you to move slowly. I never would have thought to get a filter. It’s no problem putting it on. 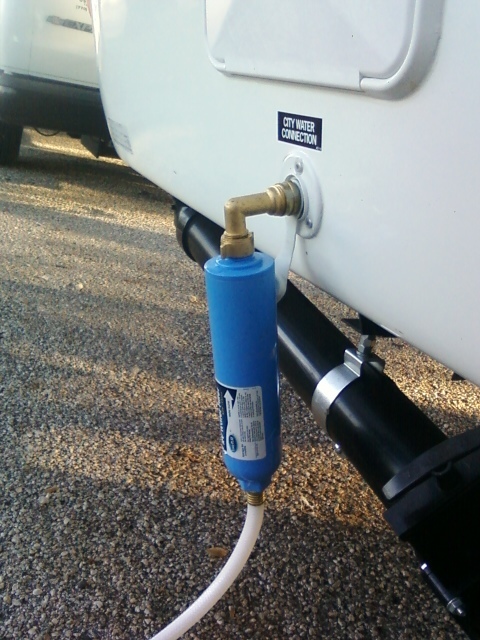 Once it’s connected to the hose, it stays connected to the hose whether at a campsite or on the road. For the door, how about using self stick Velcro to create a removeable plexi cover for the top part of the door. That would let you put it on when using the heat or AC and take it off when you want ventilation. If you decide to do that, put the loopy part of the Velcro on the door and the smoother side on the plexi so it won’t catch on stuff when it’s off. Seeing how easy it was for Paul to do your door means it’s on my “to do” list so I can sit inside with the AC on and the door open! I now pronounce you the Queen of Velcro! May your reign be long and hold fast! BTW, I wanted to post the photo of you and Paul but I can’t find my camera. I bet I left it at the campsite. Oh well.. I never liked that camera. I can’t remember, do you have a water pressure regulator ? Yes, I do! Nice of you to ask. Yep – water filter’s on my list too now. 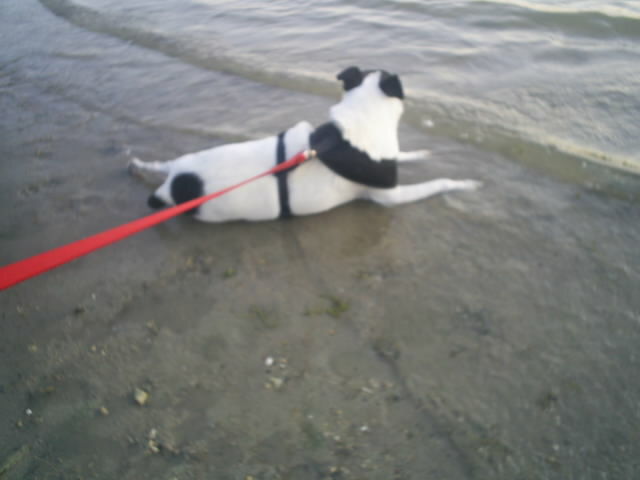 Tell me, when Spike is lounging at water’s edge, does he look as goofy from the front as he does from the back and side? (No offense – Spiky!). I’m so glad you are back, Sue! I felt like you were orbiting the dark side of the moon. Yeah, Spikey looks goofy from all angles when he’s luxuriating. No phone. No internet. No tv. I didn’t have any trouble enjoying the days without technology. Plenty of rest, leisurely walks, reading, puttering around . . . However, I did miss all the people who comment on my blog! That was weird. I was missing people I’d never met! Key question is whether you used at least the EARLY morning and LATE evening when it’s not quite so hot to reorganize the PTV so the AC vents could push out some cool? Even New Mexico can be hot when you’re on the road. Oh, I forgot to mention that. I did reorganize the PTV the last evening before leaving Hord’s Creek Lake. I put a milk crate upside down in front of the rear vent to keep stuff from shifting in front of it.